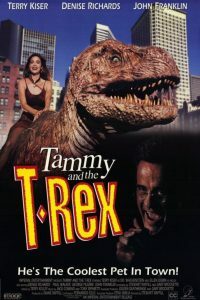 Tammy and The T-Rex is just a great film, in my opinion. Understanding that it’s hard for people to characterize dinosaurs in their movies, this movie did an alright job. I did not see anything that bad about this movie, because while it is cheesy and overrated in some scenes, it’s total fun and a complete delight. There’s even a couple of scenes I could have dealt without, but still they’re in there, and quite frankly the makers of this film did a great job with what they had to work with and created a nostalgic, yet entertaining flick that is fun to watch from beginning to end. Denise Richards being an excellent actress portrays Tammy pretty lovably, as well. This movie is very fun and I like it very much. Not many people might have heard of this movie and I believe it is their loss, really, because they’re missing out on a very interesting movie with a decent story and plot that you can just get a good kick out of. Corny, fun, interesting and light-hearted are the perfect ways to sum up this movie, and if you haven’t seen it, of course don’t expect a masterpiece, but you will enjoy it for it’s wacky characteristics and overall cheesiness, yet emotional effectiveness.